World-famous concert hall and home of the Czech Philharmonic, which performed here for the first time in 1896 under the baton of Antonín Dvořák. The neo-Renaissance building was built from 1876 to 1884. Originally it had a picture gallery, museum collections and a concert hall; from 1918-1938 and 1945-1946 it served as the National Assembly building. The main hall - Dvořák Hall - is the venue for exceptional concerts of classical music. 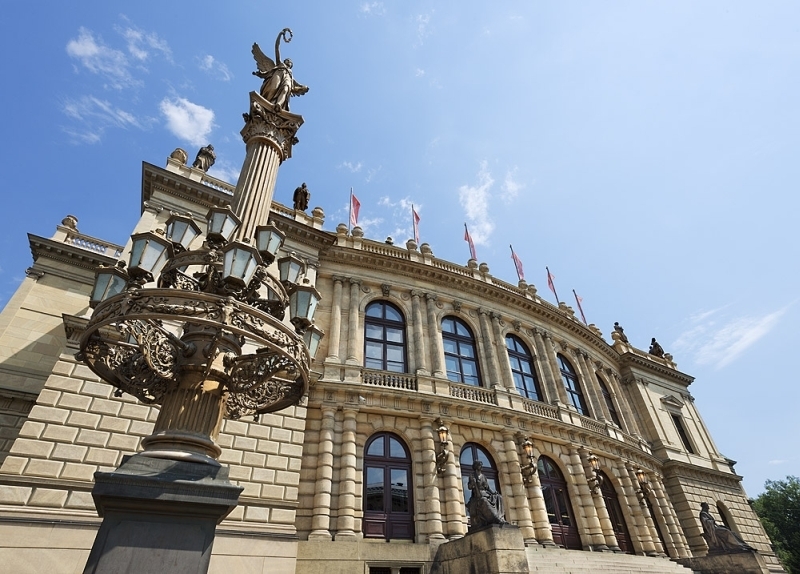 Rudolfinum is one of the most significant buildings of Bohemian new-Renaissance architecture. It is a joint work of prominent Bohemian architects of the second half of the 19th century, architect Josef Zítek (he built the National theatre) and architect Josef Schulz (he built the National museum). The object was built at the expense of Česká spořitelna, back then a German institute named Böhmische Sparkasse, the representatives of which decided to celebrate the 50th anniversary of establishment of this oldest financial institute in Prague by building a magnificent seat for the arts. The institute's representatives asked the then crown prince (archduke) Rudolf for permission to name the building after him, Rudolfinum. When the Czechoslovak republic was established, and namely after World War II, the building got a new name, the House of the Artists (Dům umělců), which was more acceptable for that time. Today, the old short name Rudolfinum is put back in place, and is also inscribed on the memorial plaques inside the building. The object was build on the land at Rejdiště, which has historically been a dump, then a wood storage, there used to be a lumber-mill and several other plants that were demolished. The enclosed land plot spreads on 5,315 m2. The building was initiated in 1876 under the supervision of ing. Václav Vejrych it was completed, including interior furnishings, in 1884, when it was consecrated. It cost two million gold pieces. It is the first modern Prague building with a complex, multipurpose operation. 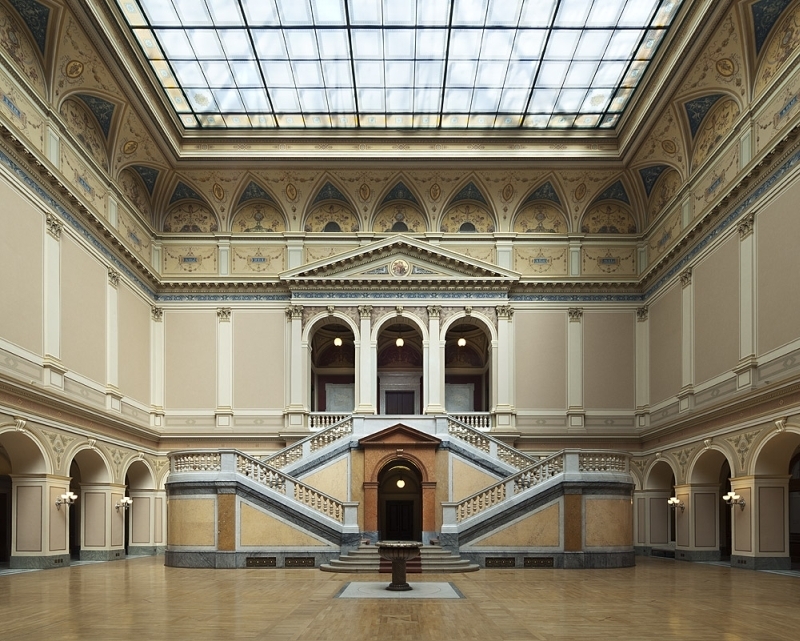 It was designed to host the labour unions of music, graphic arts and industrial arts and to serve the purposes of the Union for promoting music in Bohemia, the Patriotic union of art lovers, and the Museum of Decorative Arts. The object is built on a rectangular foundation, which is markedly divided into two independent parts: the Southern tract with Dvořák’s Hall, and the Northern part with several halls with ceiling lights, which are concentrated around the central monumental assembly hall with glass ceiling. There are altogether about 80 rooms, taking up eight thousand square metres of the surface. The ceremonious opening took place on the 7th February 1885. The headmaster of Prague art school conducted the orchestra from his institute, which played, among others, the Slavonic rhapsody II by Dvořák. Eleven years later, in January 1896, the Czech philharmonic orchestra came into existence here, which in its first concert conducted by Antonín Dvořák played the Slavonic rhapsody and the symphony From the New World. To commemorate this event, the concert hall was then renamed to Dvořák Hall. In the years 1919 - 39, the building was used as the seat of the Chamber of deputies of the Czechoslovak National Assembly, and the constructional modifications to suit its needs were carried out by architects Václav Roštlapil and Rudolf Kříženecký. It meant a significant intervention into the building’s balanced substance. In 1925, the house was interconnected with the neighbouring Academic grammar school, where the parliamentary clubs were established. In 1923, the building was passed from Česká spořitelna onto the state. During World War II, in the years 1940 - 42, part of Rudolfinum was restored by architect Antonín Engel (then the only living student of Josef Zítek) and Bohumír Kozák, to suit musical needs again, this time for the German philharmonic orchestra, which actually saved the concert parts of the building. It was namely Engel’s merit that Dvořák Hall was preserved and its acoustic properties were perfected. There is a story dating back to the time of German occupation, which says that Reichsprotector Reinhard Heydrich ordered to have the statue of Mendelssohn-Bartholdy removed from Rudolfinum’s attic because of his non-Aryan origin. The workers by mistake started to remove the statue of Hitler’s favourite Richard Wagner, but luckily, the mistake was soon discovered and everything was put in order. The statue of Mendelsohn-Bartholdy was hidden during the war, and afterwards it was returned back to its place. After the year 1945, Rudolfinum was used for concerts with the supporting background of Czech Philharmonic orchestra, and also as teaching grounds of the Academy of Musical Arts and the Arts school. In 1946, the first festival of Prague Spring was held here, attended by world-renowned pianist Rudolf Firkušný. 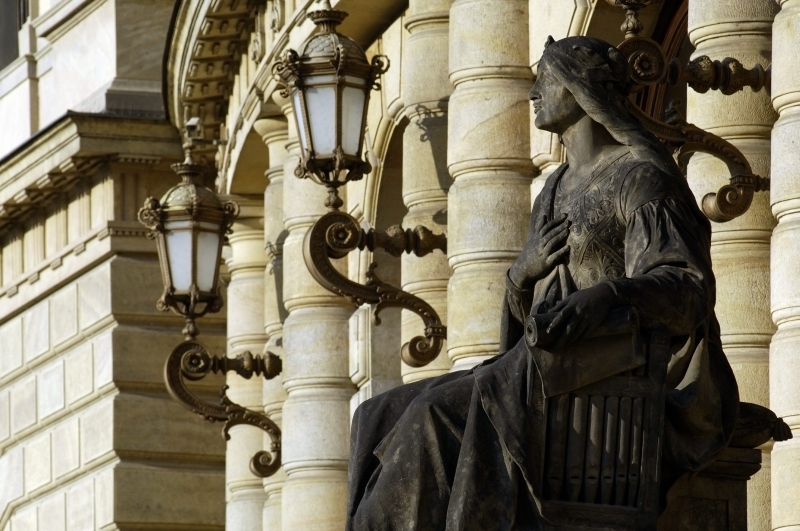 Until today, Rudolfinum is still the centre of the prestigious international festival Prague Spring. In the years 1990 - 92, Rudolfinum was restored according to the project of Karel Prager to suit the original musical and artistic function. Each detail, architectural element, as well as all the artistic decorations, including the surroundings, now correspond with the original appearance. There are restored statues of famous musicians on the building’s attic (Georg Friedrich Händel, Ludwig van Beethoven, Wolfgang Amadeus Mozart, Johann Sebastian Bach, and others), which were made by Austrian and German artists, but also by our important sculptors Ludvík Šimek, Tomáš Seidan, Bohuslav Schnirch, Bernard Seeling, Jindřich Čapek, and others. They also made the sitting musical Muses on the sides of the exterior staircase from the square, and the statues of lion couples and sphinxes by the covered underpass in the East and by the entrance to the exhibition hall. The stone sphinxes by the entrance from the river bank have a bee on their chests, as a symbol of thriftiness of Česká spořitelna, which financed the construction. The same bee symbol is in Dvořák Hall, where two little angels carry a golden bee in a blue field. There are 1,023 places in the Dvořák Hall. Its acoustics is on a world’s level; there is a stage with air-conditioning built in the floor. The walls of Dvořák Hall were supposed to be decorated with themes from the history of art, but Czech painters did not participate in the artistic competition at the time, and so the places designated for paintings remained empty. There are busts of the following important musicians in Dvořák Hall: Václav Talich, Rafael Kubelík, František Stupka, Václav Neumann, Karel Šejna. Next to Dvořák Hall, there is the Small Hall, today Suk Hall with 211 places, which has been used for chamber music for over a hundred years, and where the composer and interpreter Josef Suk began his artistic career as a student of Dvořák. The composer’s grandson, a violinist Josef Suk unveiled a bust of the composer Josef Suk, made by Otakar Španiel. In 1994, a memorial hall was opened here with an exposition of a violin master Jan Kubelík. A large well-lit hall with several Corinthian pillars was originally used for graphic arts exhibitions, and later as an archive, quite unseemly. 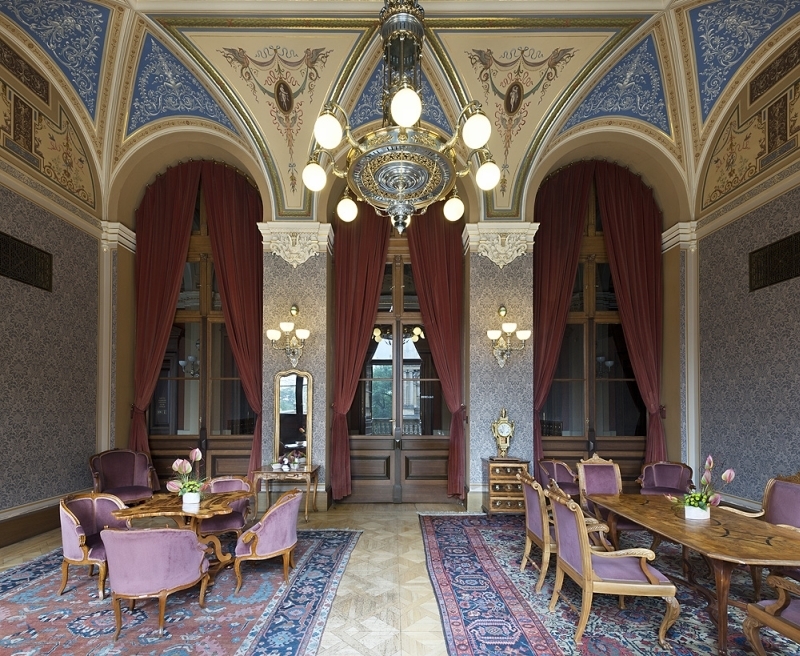 After a reconstruction, there is now a beautiful café for public, which also serves the purposes of banquets. There is an elegant presidential lounge on the first floor overlooking the 17. listopadu Street, accessible via a side entrance, so called coach entrance, from this street. It has a beautiful vaulted ceiling, and is equipped with stylish furniture and accessories. The original fountain, which used to be located in the large vestibule, was transferred to the area of the cash desks. It is made of parts brought from the Museum of cast iron in Komárov. A splendid organ was returned to the original place from Brno, being manufactured for Rudolfinum in 1884 by a German organist Sauer from Frankfurt and decorated by a sculptor Müller from Munich. 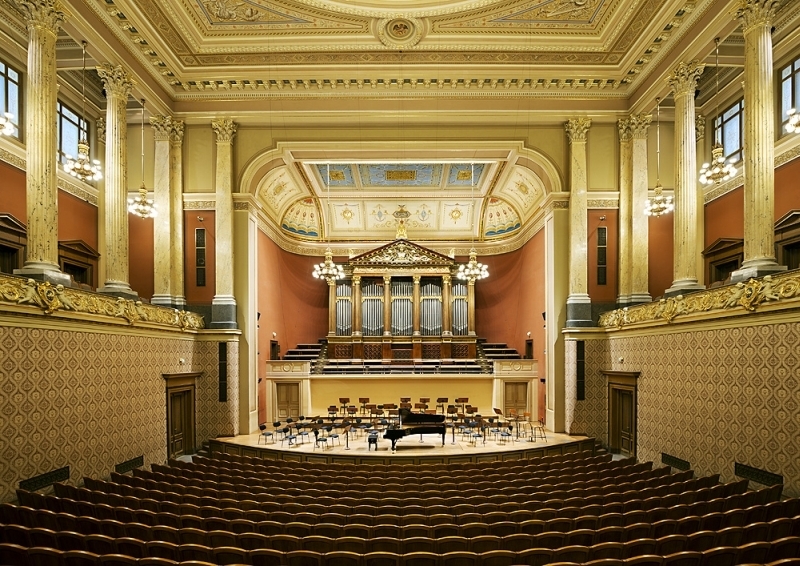 The organ was transferred to Brno in the years Rudolfinum was used as the Chamber of deputies. Also the pylons of the festive lighting were restored in the original place after reconstruction, with bronze pedestals, which were cast in 1885 and which are made of more than four thousand components. They measure 14 m and they had to be disassembled for the purposes of the reconstruction. The entire object is barrier-free. Rudolfinum is a National Cultural Monument.